As I’ve shared with you all before, I love to entertain! And one of my favorite things about entertaining (besides the people!) 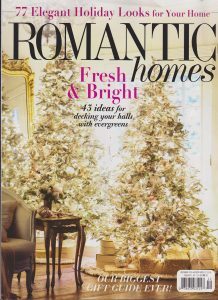 is getting a chance to do a new tablescape! Not only does a pretty table add so much to the meal we are sharing, it’s also a great way for me to get my creative juices flowing. 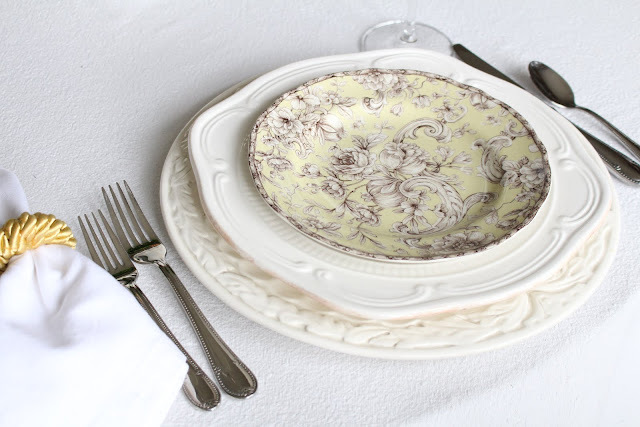 If you’re looking for ideas for your own table settings, be sure to check out my free e-book with twelve pretty (and easy!) tablescapes! 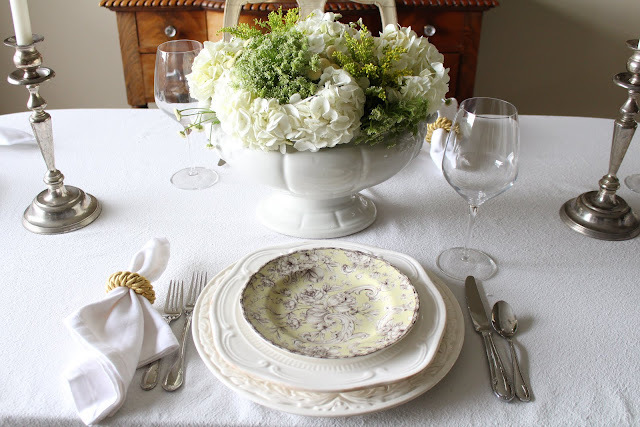 With that in mind, I wanted to create a spring floral tablescape. One that would work as easily for Mother’s Day brunch as it would for a spring dinner party or even a shower. 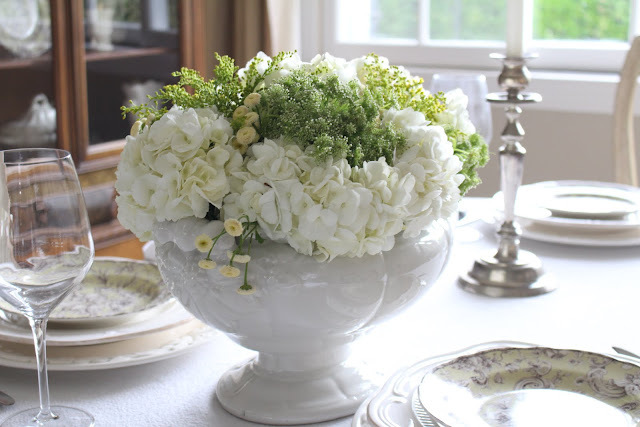 What I will say about doing spring tables, is I was very bound by what was available in the floral department! I really wanted to do something featuring lilacs, but after looking all over town to no avail, I finally realized it just wasn’t going to happen. So I went with Plan B. I have some adorable green floral plates from Home Goods that I love, so I decided to do a mostly green and white table with those as the focus. They set the tone, and I went from there. 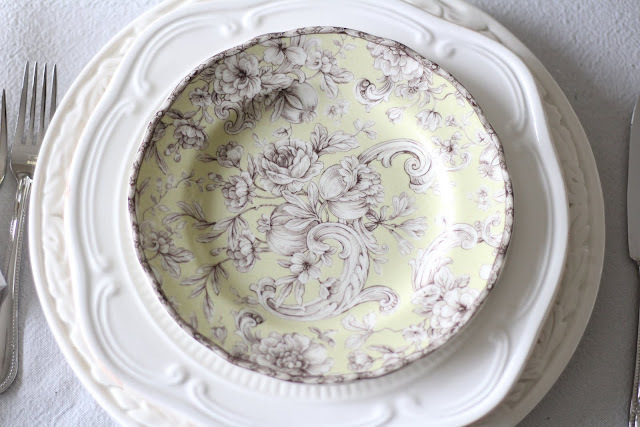 The charming toile plates were Home Goods a few years ago and I just fell in love with them! 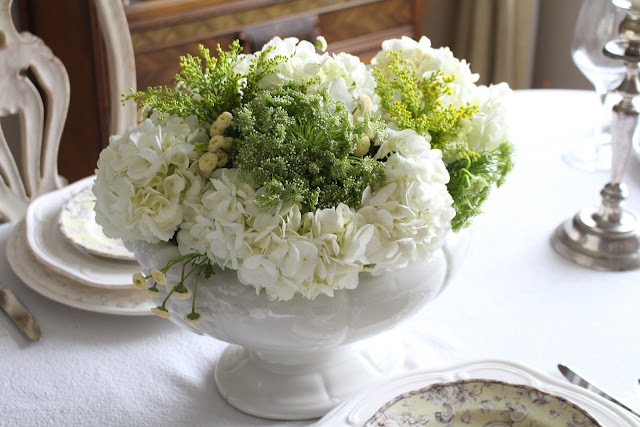 The centerpiece is white and green hydrangeas in an antique ironstone tureen. I also added the little yellow flowers to play off the yellowish tint of the plates. Silver candlesticks are vintage. I layered the green salad plate over a white dinner plate and white charger. 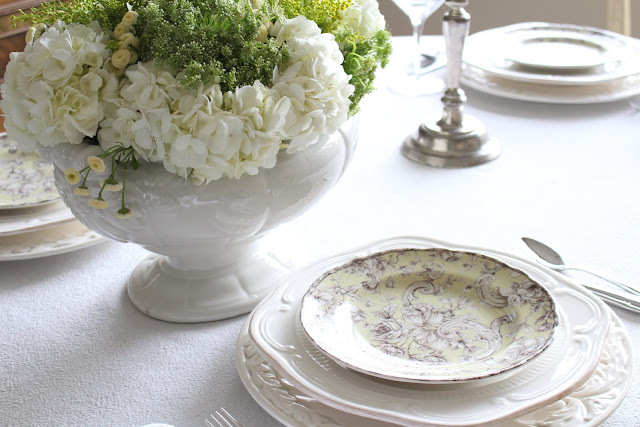 I love the way chargers add more texture and interest to the place setting! 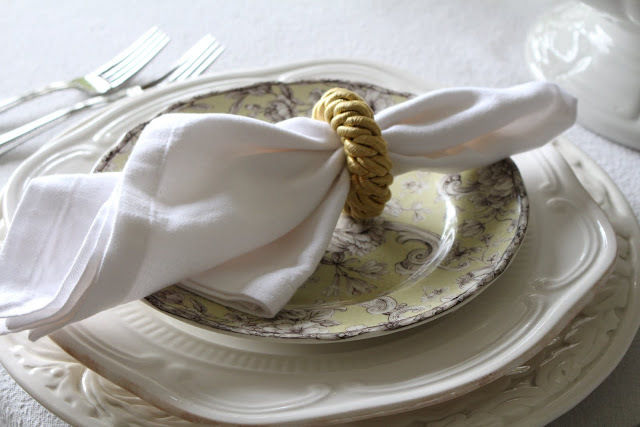 White cloth napkin with a gold rope napkin ring. The flowers are just so cheerful – they really scream spring to me! I think this table could definitely work for anything from Easter, to Passover, or even a baby or wedding shower! The table is very simple – but that’s what I wanted. I wanted the spring flowers to be the focus, and I think they are! 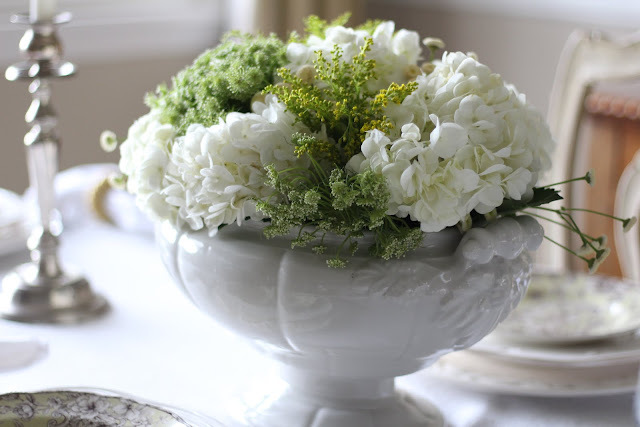 For more spring tablescapes, you can click on any of the links below. 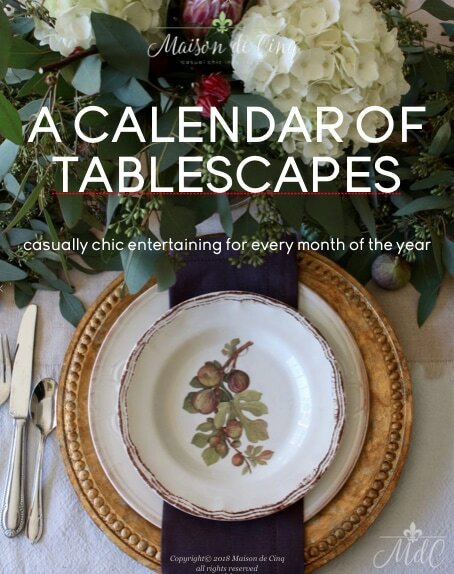 And for even more tablescapes (including lots of tips and tricks!) 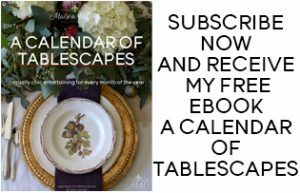 sign up for my emails and get your free e-book, A Calendar of Tablescapes! Hope you are all enjoying a wonderful Spring! Thanks Angelina! Happy Mother's Day to you as well sweetie! So pretty! Happy Mother's Day! Thank you Nellie! Wishing you a wonderful Mother's Day too! Thanks Deserae! Hope your Mother's Day is wonderful as well! Thank you so much Valerie! I so appreciate your kind words – thanks so much for stopping by the blog!